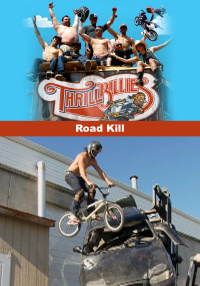 The Thrillbillies are a group of redneck friends looking for the ultimate thrill. In this episode, Refus and Pop, host a bar-b-que, Cam and Crum have a tug of war with cars, a go cart is jumped over a small body of water, and Gavin and the boys use a bungee cord for snow launching purposes. Refus introduces a lonely Pop to speed dating, the boys try their hand at back flipping motorcycles, and Crum does some hood surfing. The boys play Crack the Egg, Shrimpy gets a massage, Crum and Cam learn to fly kites, and Zach gets lost wakeboarding. Pat teaches the boys how to talk, Cam crashes his toilet, and they mix BMX with barrel bull riding. Reefus gives a Thrillbillie wannabe a shot at the big time, Derek and Dusty do some tandem moto freestyle, and big jumps happen at the little swimmin hole. Refus and Shrimpy try to help their fellow man, Crum jumps his snowmobile into the lake, Whitney meets her match in quad wars, and Cam demonstrates his monster truck driving skills. Refus and Nillie take advantage of a two for one ski pass, the boys do some muddy skim boarding, and Pat goes big on his bike. Refus and Pops hunt chickens at Thrillbillie ranch, the boys launch off the mini mega ramp, and the fishing boat gets whipped with Crum and crew on board. Refus, Pops, and the gang practice for the big Hoe Down*on Segways. The guys race the Squaw Peak downhill, go mud bogging, and Pat does some redneck freestyle BMX. Refus gets busted by the Police, Hucker hits a big jet ski jump, Cam wheelies the motorhome, and the Thrillbillies compete on the chicken ranch track. Refus looks back on some of the Thrillbillies* finer moments, featuring Cam, Crum, Whitney, Jared, and Johnny and great moments in Thrillbillie history are highlighted. 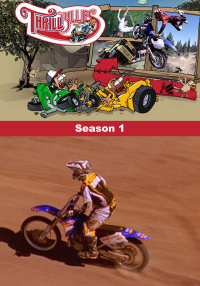 Refus looks back on some of the Thrillbillies' more historic moments, featuring Gavin, Shrimpy, Gavin, Dusty, and Pat. Great moments in Thrillbillie history are highlighted. The Thrillbillies also use Segways to play a game of h.o.r.s.e. and get intoother mischief in the great state of Utah.